My highlight on this trip so far!!! Next day I arrived very exited at the meeting point where my guide and some other guys from Oxalis Tours were already waiting, a former british soldier joined us. They gave us shoes, helmets, headlights and some gloves and told us to wear our trousers in the socks or the shoes because of leeches. 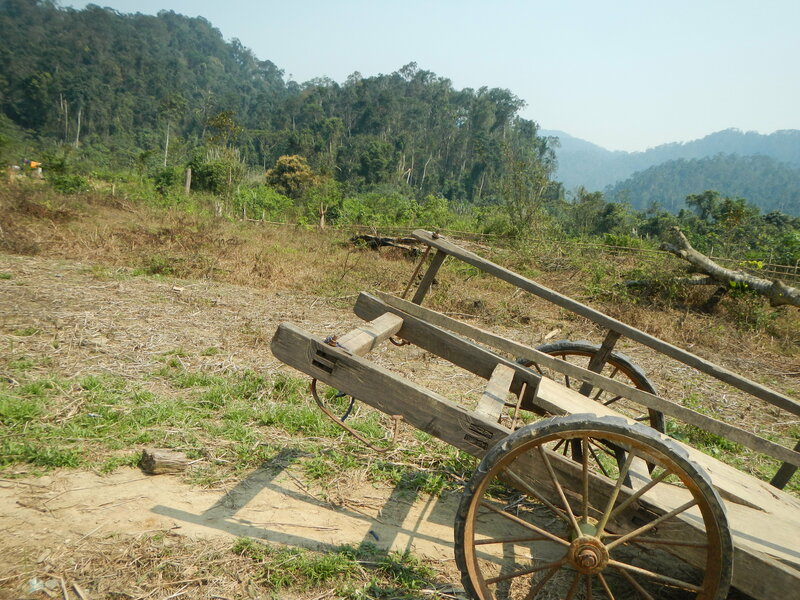 We started trekking immediately, down a hill, into the dense jungle. As the distance to the sealed road increased, it was getting louder and louder. Birds where singing, there was this characteristic distinctive call of monkeys and a hiss to hear in the bushes surrounding us. Suddenly the trees started moving and leaves fell down, all faces rose, when I looked at our guide I could see a thinly luster in his eyes. He waved his arm towards the treetops, and through all this green, two piercing eyes were watching us inquisitively. And finally a small monkey became visible over the tops of the trees. I enjoyed this moment so much, that I forgot to take some pictures of this beautiful creature. It presented us some of its excellent techniques by jumping from tree to tree. We walked on, sensitive to the beauty around us. There were plants, I had never seen before. Marvellous flowers, with huge thorns, mushrooms grew in formations as big as hats. Our guide picked a few of them in order to cook them later. 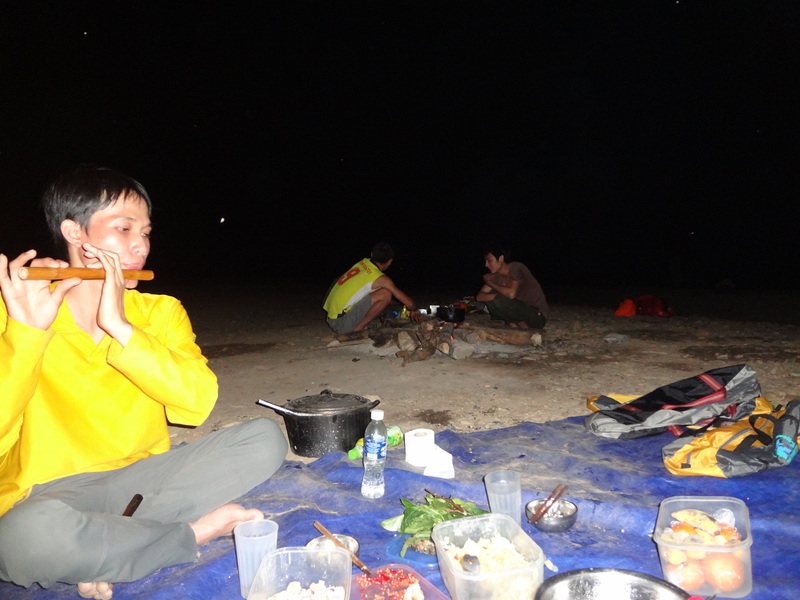 Due to high humidity and temperature it was really exhausting, we had to drink around five liters of water a day. Because nobody could carry such a huge amount of water bottles, we had a portable water purification unit to clean the water from the rivers. When we arrived at the first one, it was time for a short stop and rest as well. It was an inspiring, mystic place, where plants could still develop at their own speed, competiting for sunlight, where leaves and blossoms were offering an abundance of fresh nutrition, where innumerable butterflies were living. I couldn’t sit still, everything was very different and so beautiful, that I spent the break running around taking pictures. My curiousity increased and urged my desire to see more of this remote and exotic jungle. 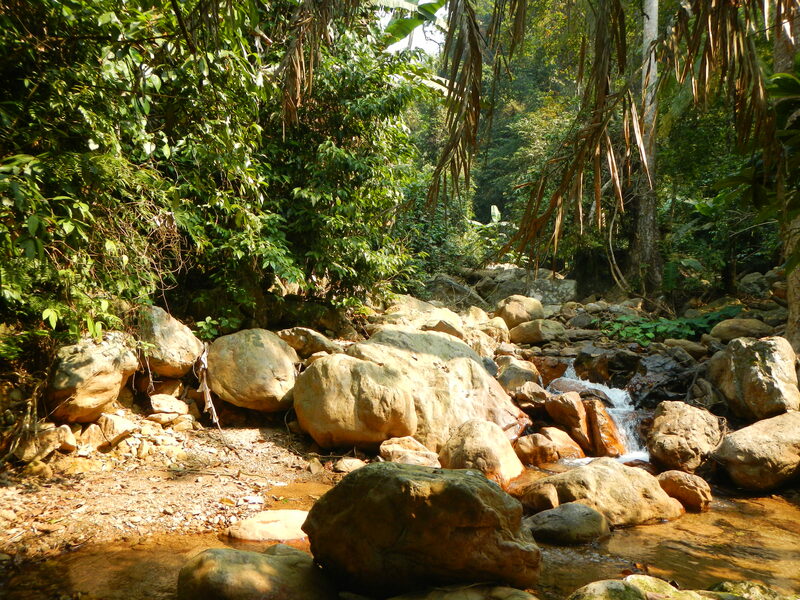 The journey continued through dense jungle, ultimate wilderness everywhere. Rather often we crossed wide streams. Descending a small mountain, the jungle opend, we had reached an isolated ethnic minority village. 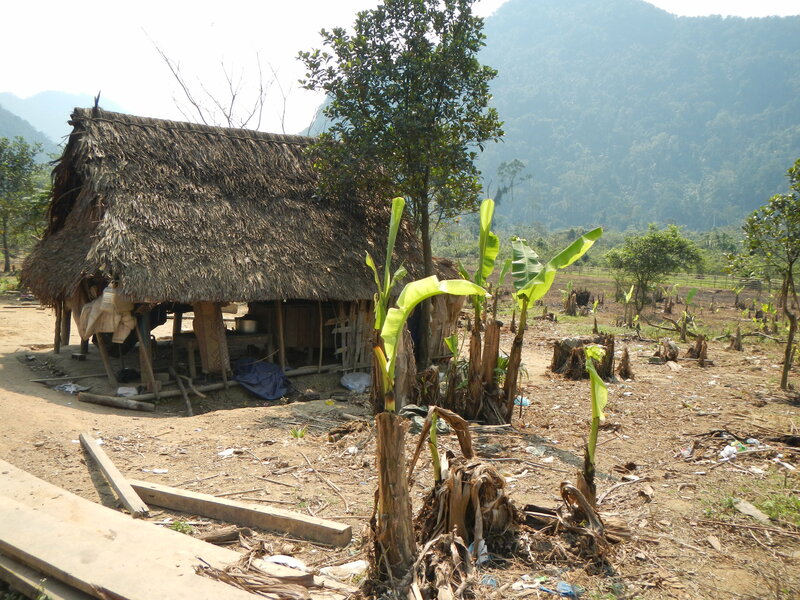 Only 42 people where living there in huts surrounded by a beautiful landscape. It’s a beauty you can only experience by being there, pictures can hardly describe it. I felt as if I were an actor in one of those movies about vietnam war, with the only exception that there were no sceneries faking unreal fakts. The people living there had nothing except a few stuff other travelers have left there, including some trousers, shoes and backpacks. But they were very warm at heart. We sat there in de midday sun, drinking freshly brewed tea, while our guide tried to close the gap between our different languages. They had so many questions, and he translated everything patiently. They asked me about life in big cities. It’s much quicker. There, at this remote place nobody had a feeling of stress. An old woman told us stories about her life. She was petite of build and delicate of constitution but could carry a sack of rice twice as big as my overstuffed backpack on her head! But around her eyes, I could see everything that she must have been facing in all those years, leaving visible traces on her skin and deep wrinkles. I didn‘t dare to ask her something about the war, because these people were just living in the center where huge battles have taken place. My thoughts were interrupted by the hoot of an owl, which was suddenly sitting next to me. The ethnic people found it wounded, not able to fly anymore somewhere near the village. They had fed it and now it‘s living with them. But its wings havn’t healed yet. 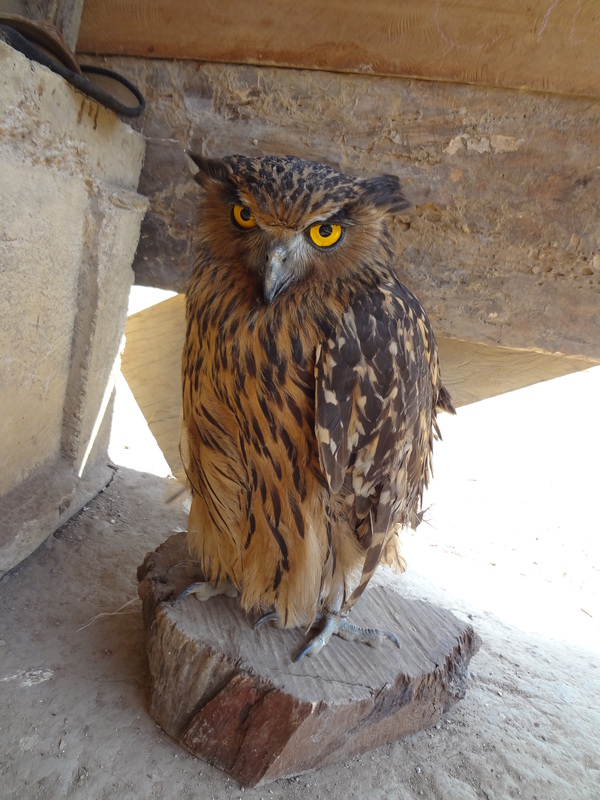 I stroked its little head, never stroked an owl before. Its large yellow eyes formed a great contrast to its brown fethers. We went on, wading through rivers, with open mouths and open minds, enjoying every minute, trying to get as much as we could from this sensitive beauty. And then we could see it, rising up into the sky, reminding us of the power of nature, that we are only guests on this planet. 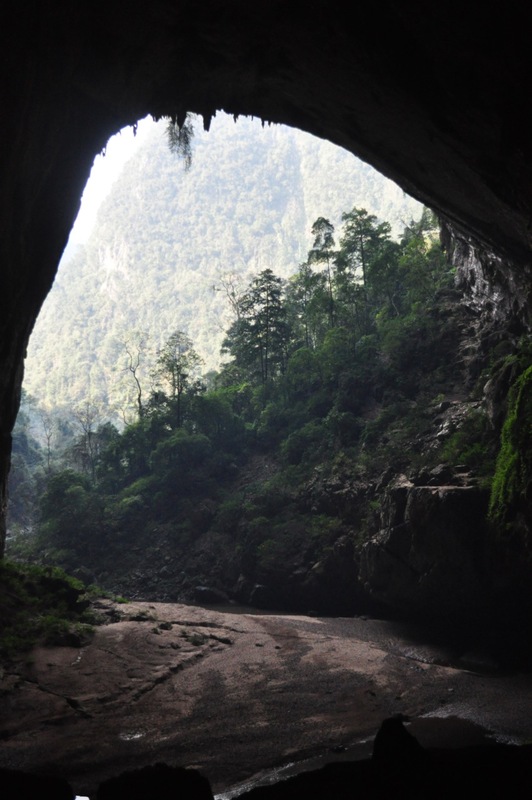 There it was, like a huge window built in the rock, hidden by high trees like a well-kept secret, the entry of Hang En. We followed the river to a narrow opening in the rock, the portal into a long-forgotten world. We were excited, not knowing what was awaiting us. We thought the jungle was already mindblowing, little we know. Now time had come to use our headlights. We switched them on and started scrambling up rocks, trying not to trip. After minutes of absolut darkness surrounding us, we were blinded by the light shining into the cavern from the huge window of the cave. I closed my eyes and felt the sun warming my skin. Being on the top we had an incredible view! Below us, there was a lake, surounded by a beach, it’s water had a shade of blue I have never seen before, the sand of the beach was white like snow and delighted by the sun. This was the place where we would spend the night. 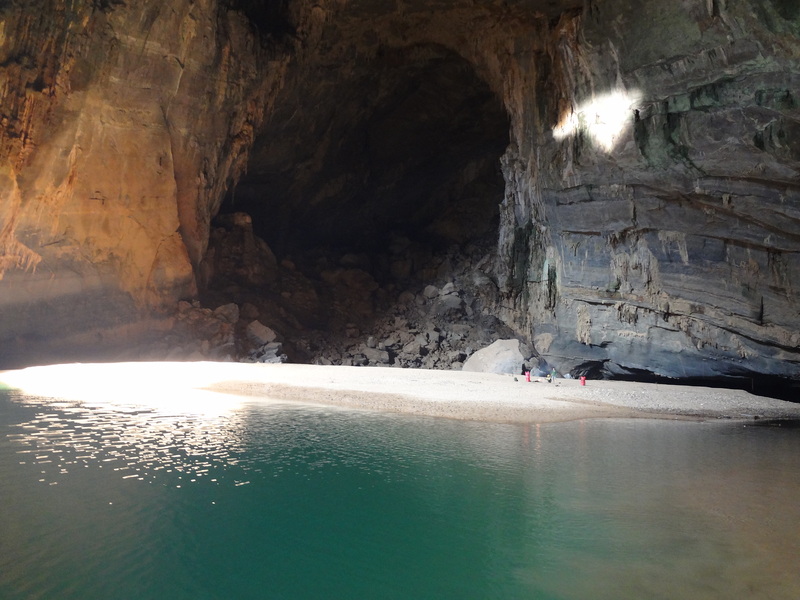 But first we had to discover the main entrance of the cave, the place BBC and National Geographic had already about. 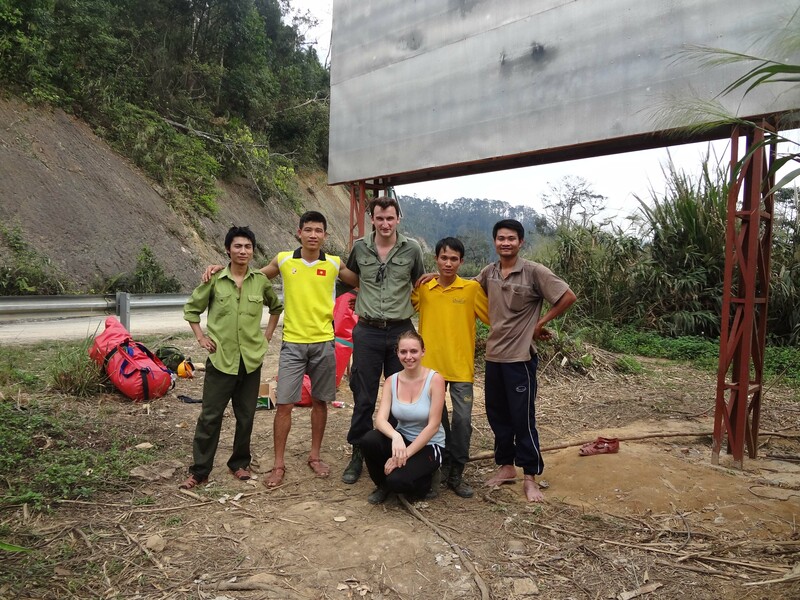 Arriving at the campside, we left everything we carried there and jumped into the underground river. It brought us to another beach, in the middle of the cave, where fossils, the remainders of animals, were preserved in massive rocks. We had to climb again up on steep rocky facades, when we reached the top I was simply overwhelmed! Even the pictures I took couldn’t portray the beauty and size of this natural paradise! The cavern was so huge, you could even put a whole battleship inside! And looking out of it, there was jungle. Nothing else. This place in a way took us back to the age of dinosaurs. The more it was fascinating to think about the many eras, this cave has survived so far and remained the same way. 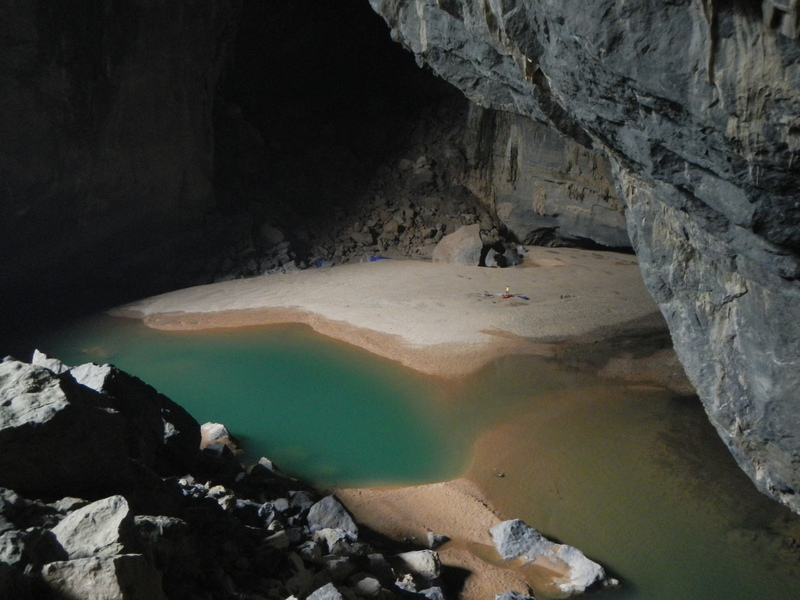 The river flowing out of the cave, leads directy to Sơn-Đoòng. Our tourguide told us stories about people, who have tried to find this cave on their own. An American returned after a week. He went into the jungle, only with some cookies and one bottle of water. His hands were carved and this clothes torn when he finally came back. A Chinese man was out there too, but he didn’t return. They found him just behind the huge cavern. Animals had gnawed on him. 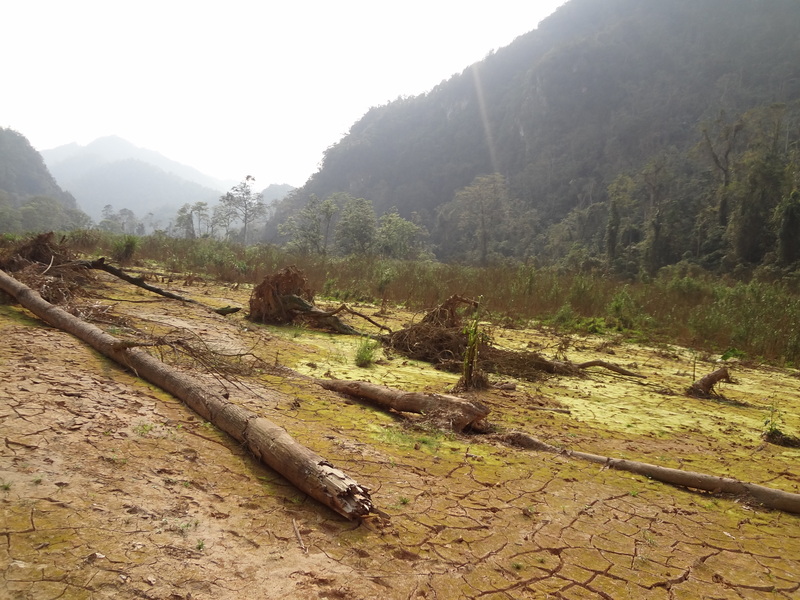 I thought of convincing the guide of moving on to Sơn-Đoòng, but night would draw in soon and we wouldn‘t reach it before sundown. We returned to our camp for the night, where the other guys had already set up the tents. After this exhausting day, none of us had any dry clothes left. I was convinced we would leave this place only as fish 🙂 But now it was time for dinner. As the sun slowly set and twilight casted the last patches of day on a narrow strip of stone on the huge wall behind us, Hang Ens window looked like a portal into the darkness of the night. There was absolute silence for a short period of time, then swallows startet to raise their tiny voices melting together into a thunderous orchestra. I asked our guide how many of them live in this cave? Approximately houndreds of thousands, he told me. Because it was getting colder, we gattered around the campfire. We sat there drinking rice snaps, chatting and singing, while our guide played the flute. It was a magical moment. One of these unbelievable moments you try to capture, because you know they will dominate your life for years and in retrospective will make it indescribable. I cuddled down in my sleeping bag very early. 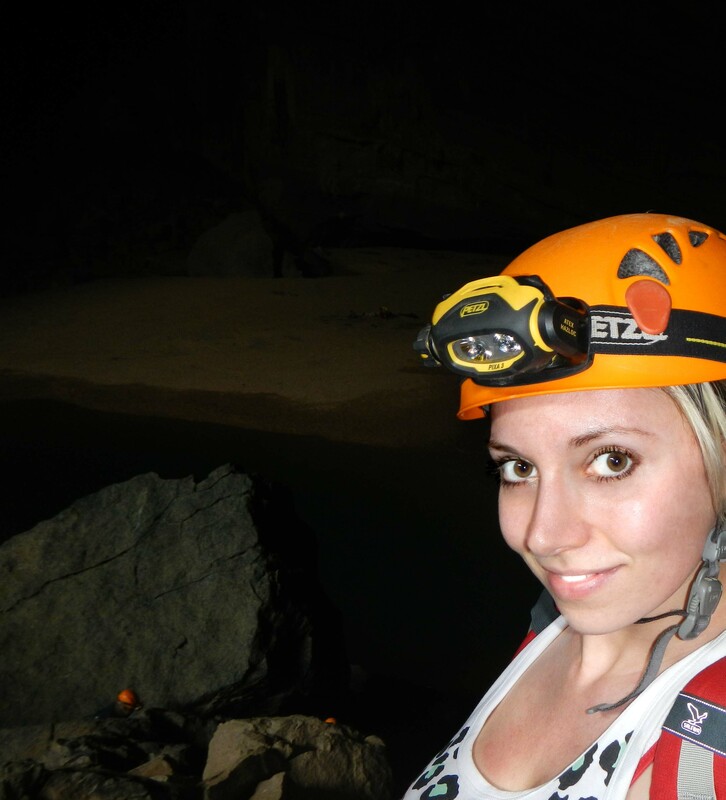 The overnight in the cave far away from civilisation was amazing. The birds where singin all night, and the crackling of the campfire cunjured up a superb atmosphere, while the crack was leading the sounds of animals into the cave. Despite the fact that I was in the middle of the jungle sleeping in a tent, I felt secure. With a bright smile on my face I fell asleep. I woke up when the first rays of sunlight shined through the window. Curiosity brought me out of my comforting and warm sleeping bag into the coldness of the morning. 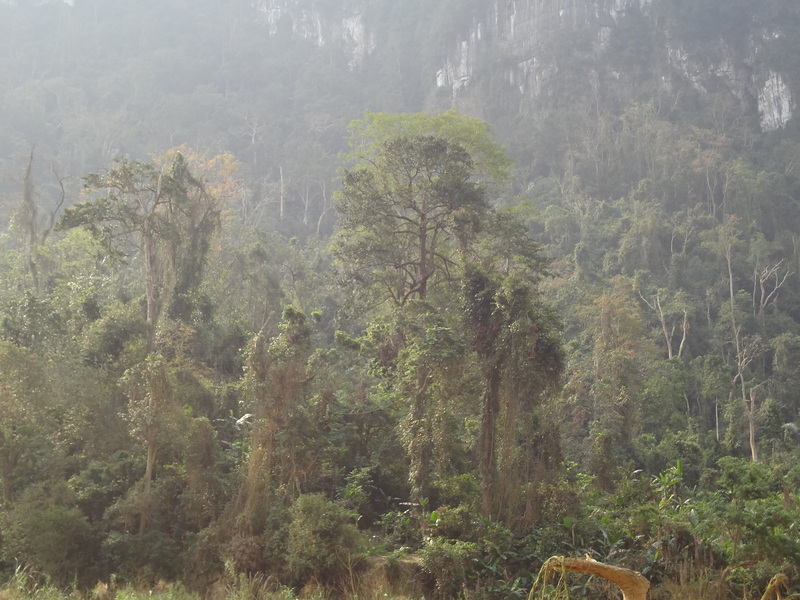 Mist was lingering over the rich greenery of the jungle outside. Enrupted, I watched the bright light restore the colours to shapes that at dawn where gray and now appeared in a red sea of flames, as the glowing ball rose over the treetops, bringing back life into this remote place. 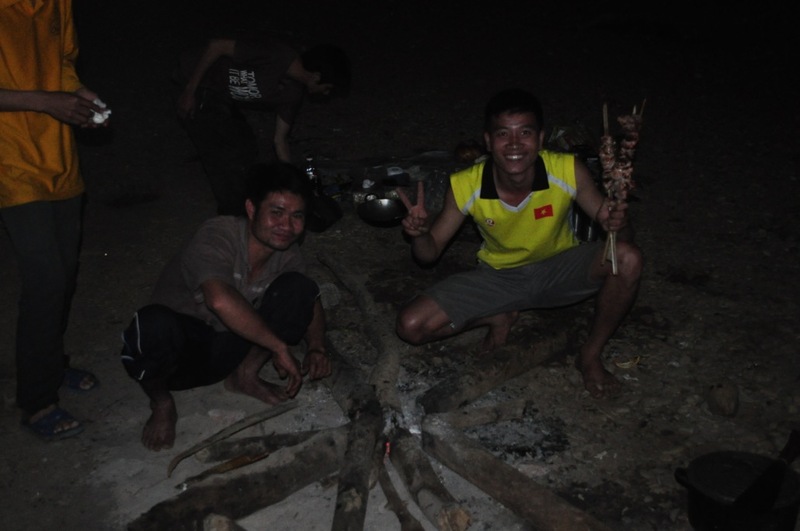 The vietnamese guys where already preparing breakfast, spring rolls and rice. Yes, those people like to eat hearty dishes in the morning. I am therefore at complete loss to explain why they stay so slim. After meal, we left this place, but just before our campside disappeared behind rocky walls, I turned around once more, looking back with pride at this amazing place feeling the awesome power of nature in silent joy and thankfulness. The way back was much more exhausting, because now we had to walk uphill. After 5 hours including some breaks, we reached the starting point again where we were picked up. I was very tired, but also happy to have experienced this great adventure. Sounds like such an incredible adventure! 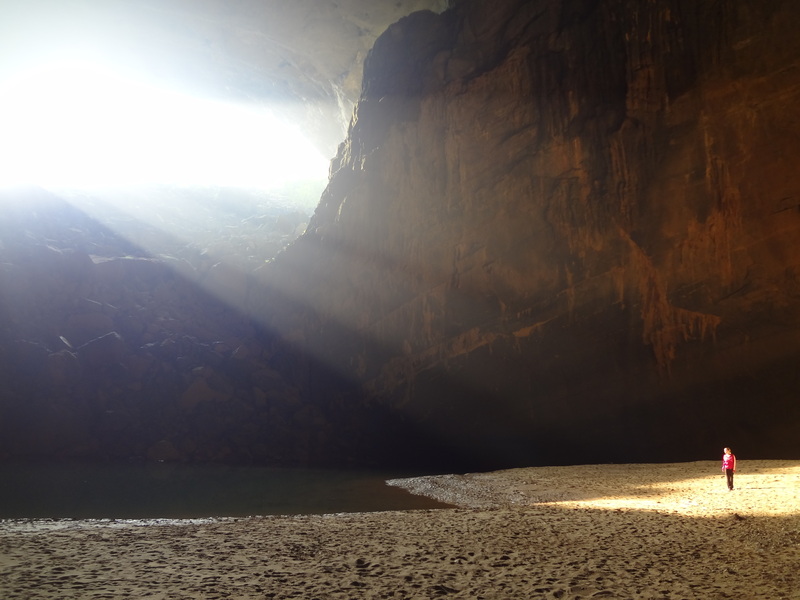 That picture of the cave with the light streaming through and the tiny figure… amazing, I am very jealous.